The emerging development of Information and Communication Technology has brought many changes in almost all aspects of life. Newly developed electronic banking services like ATM Cards and e-banking, are replacing the traditional banking practice. The aim of this study is to look into the effect of product improvements, reliability and efficiency on customer satisfaction of electronic banking services. After a comprehensive literature review, the study provides a statistical analysis through a questionnaire which has been distributed to investigate the effect of product improvements, reliability and efficiency on customer satisfaction. Regarding the results obtained from the questionnaire, it is seen that all Cronbach’s Alpha values are within the acceptable level, whereas services and reliability are strongly correlated, but correlation between efficiency and satisfaction is weak. In the regression analysis, it was seen that while service and reliability have positive effect on customer satisfaction, efficiency`s effect is negative. There are different definitions of e-banking. E-banking was defined as delivery of the information and services of the bank to the customers through different ways, like computers, mobile phones etc. . Another definition of e-banking is that with the click of the mouse customers can access at almost all the banking transaction expect withdrawals [2-4]. E-banking was defined as an internet portal that customers can use for different banking services . Usage of the internet as an alternative channel for financial services has become a competitive necessity . It is believed that a relationship of the banks to their customers can be established and extended to the supply of e-banking . However, a customer satisfaction is significantly increased in the intangible item with the value proposition. This increase is translated in the improvement of loyalty of customers, which results in the growth of the organization and customer retention . Different authors have defined customer satisfaction in different contexts. One of the customer satisfaction definitions is as a psychological concept involving the feeling of pleasure that results of what is expected and hoped from any service or product . One of the most important practical issues as well as theoretical issues for most customer satisfaction researchers is that, firstly it is defined in the consumption context as the summary, psychological state resulting when the emotion surrounding disconfirmed expectations is coupled with the customer’s prior feelings about the consumption experience [10-12]. Evaluation after purchases and affective responses to the service experience or to the overall product also is a customer satisfaction . Satisfaction is the result not going wrong of the things, therefore satisfying the consumers’ needs and desires [14,15]. Some researchers define satisfaction as cumulative, some others sees it as a transaction. Customer satisfaction from the view of transactions is based on a one-time post purchases judgment of a service encounter . Customer Satisfaction in cumulative perception is an overall evaluation of a service or a product from customers based on consumption experience and purchases over a time period . In the other words, satisfaction reflects a post purchase evaluation of the quality of the product it was said that satisfaction traditionally has been defined as a cognitive-based phenomenon [18,19]. Known as the confirmation/disconfirmation paradigm, cognition has been studied mainly in terms of the expectations/disconfirmation paradigm, which states that expectations originate from the customer's beliefs about the level of performance that a service would offer . The relationship of the size and direction of disconfirmation indicates the customer satisfaction that is the difference of post usage and post purchase of product or service performance evaluation compared to the expectation prior purchase [20-23]. Some studies have recognized that significant influence on satisfaction judgment has also affect experience during the consumption of the product or service [24,25]. Affective responses to customer can be used more accurately to predict satisfaction . Hence, it is hypothesized that on customer loyalty the customer satisfaction has a positive impact. Also, it was argued that while a series of purchases and consumption experiences where cumulative satisfaction is based, it is more reliable and useful as a prediction tool and diagnostics than the transaction which is based in one time purchase. In online shopping and online banking, as the most important element for service quality enhancement was recognized as a customer service . In many previous studies the elements of customer service have been noted [27-29]. On time delivery of the products, quick answer of emails and access to the information is the expectations of customers in order to be able to complete correctly transactions. Factors for the electronic banking services are: accurate process of the transaction, the validity of the links on the portal, e-banking portal loads quickly, performs transaction for the first time and correctly, in case of problems there are guides of solving them. Assurance and reliability are some key elements of electronic banking services [27-30]. Electronic banking services in order to be reliable and trusted, it should be designed for trust, therefore it should be considered from the beginning the factors like Reliability, Privacy and Security . Reliability is one of the most important dimensions of service quality, with the reliability it is meant the banks/organizations perform for the first time the service . For measuring the online service quality was developed e-SERVQUAL, where there have been identified eleven dimensions of online service quality, reliability one of the most important of theme . For the service quality of online securities brokerage, there have been identified six key dimensions: Reliability, Responsiveness, Competence, Ease of Use, Security and Product Portfolio . There have been proposed 15 dimensions among theme reliability as one of the important dimensions for online service quality . There have been identified four dimensions of online service quality, and one of the four identified dimensions the strongest predictor of customer satisfaction is reliability . The level of the trust at any institution can be the main reason of usage of e-banking. It is claimed that the importance of the trust and rigorous security controls for the efficient electronic banking. Therefore this can be the reason of taking electronic banking services may be the trust to an institution [37,38]. Effectiveness within an organization is affected by both leadership and organizational culture . The ability of the customers to find the most wanted products refers to the efficiency . For the greatest latitude of success the organizational structure needs to employ flexible and elastic organizational structure sub-systems that are technology, environment and culture . Efficiency has been defined as the extent to which a decision-making unit can increase its outputs without increasing its inputs, or reduce its input without reducing its output . Generally the literature of banking efficiency can be categorized into studies of the investigation of scope efficiency alone and scale [43-50]. The analysis of industry outlining the impact of electronic banking services on savings, growth of revenues and risk profile of the banks also have generated speculation and interest on the impact of the internet in the banking sector . In order to achieve higher efficiency, the electronic banking services were adopted to decrease paper print and reduce cost with automatization of processes and leading to higher profitability and productivity. A questionnaire has been delivered to collect the data within this study. There were 52 responses, but 46 of the questionnaires were properly filled out. The survey was distributed through social media in internet. 25% of the participants were females while and 75% they were males. The age rang was from 18 to 60 years, responses were from different range of education starting from bachelor to PhD. As well as regarding working status we have had responses from unemployed, employed in public sector, employed in private sector, private business and self-employed. All responses were collected online and were accessed using 5-point Likert type scale, with scales 1 - very dissatisfied, 2 - dissatisfied, 3 - neutral, 4 - satisfied and 5 - very satisfied. Customer Satisfaction being the dependent variable of this study refers to customers` contentment about two electronic banking services: ATM and e-banking. 5 questions were used for ATM and 7 questions were used for e-banking satisfaction usage. The other variables (product improvements, reliability and efficiency) are the independent variables of the study. For the product improvements, which we named services shortly, we used 8 questions related to electronic banking products of what kind of technology used, location and number of ATMs, usability etc. About reliability we used 5 questions in our questionnaire that were about range of products offered, information provided. In efficiency, we used to have two questions that we measured about login and faster usage of e-banking and ATM/banking card performance. The study aims to find the linear equation that explains the relation among variables and moreover provides the correlations among all variables. The study has below hypotheses related with the analysis and furthermore the study aims to explain the numerical details of the relation among the variables. Hypothesis 1: The product improvements as a variable has a positive effect on customer satisfaction. Hypothesis 2: Reliability has a positive effect on customer satisfaction. Hypothesis 3: Efficiency has a positive effect on customer satisfaction. The first test that we will implement is related with the construct reliability of the material. Construct Reliability is assessed using Cronbach’s Alpha  suggests that Cronbach’s Alpha should at least equal 0,70. Table 1 presents the Cronbach’s Alpha values of our study (Table 1). As it can be clearly seen from the Table 1 all the Cronbach`s alpha values are at the acceptable level. Secondly correlation among variables will be analyzed. Table 2 shows the correlations among the variables. 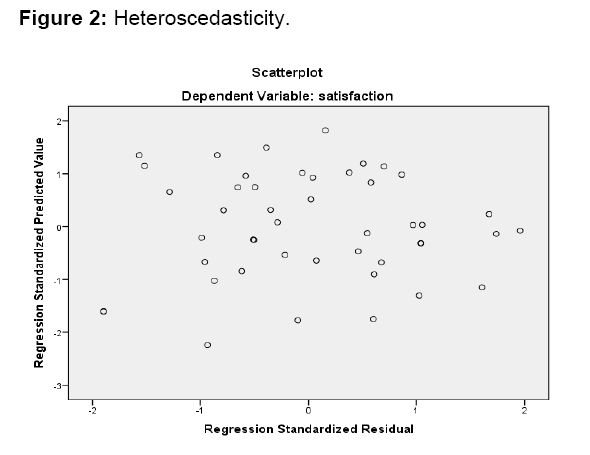 According to Table 2 there is a rather than the correlation between efficiency and satisfaction all the other correlation figures are between 0,5 and 0,7 which means there are relatively strong correlations among the mentioned variables whereas the correlation between efficiency and satisfaction is a relatively weak. The second analysis of the study, regression, on the other hand, as stated above focuses on finding the linear equation that describes the relation among dependent variable and independent variables. Table 3 provides the summary of the regression model. Table 3 indicates that the adjusted R square is 0.501 meaning that the independent variables explain the 50 percent of the total effect on customer satisfaction. Durbin Watson figure will be mentioned below when analyzing the assumptions of regression indicates that the significance of the model in general is .000 which is acceptable at the 99 percent confidence level (Table 4). Table 5 indicates that all dependent variables have acceptable significance levels at the 95 percent confidence level. So the regression function is Customer Satisfaction=1.605+0.522 Product Improvements +0.383 Reliability -0.310 Efficiency. The assumptions of Regression model should be checked as well. The first assumption is normality assumption of the residuals. Figure 1 show the distribution of the dependent variable customer satisfaction. 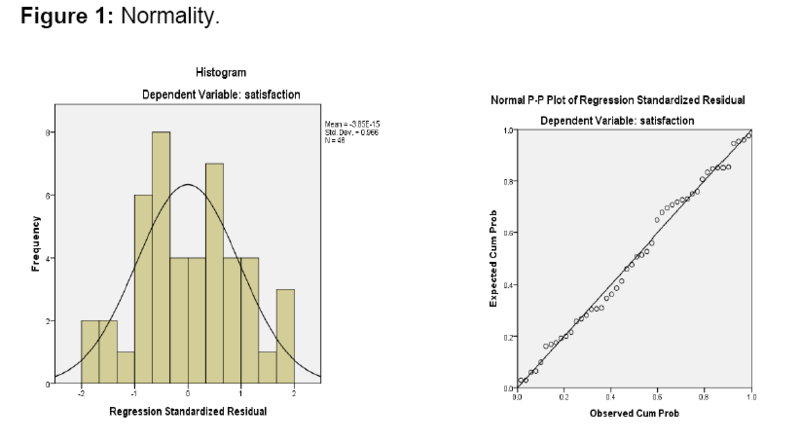 Given the figures above it can be concluded that the residuals are normally distributed. Checking the assumption with the above Figure 2, shows that there is no problem regarding heteroscedasticity. Multicollinearity does not seem to be a problem because the VIF figures are less than 10. The last assumption to be focused on is autocorrelation assumption. If Durbin Watson test is applied the results below are obtained. Here, our d value of 2.48 is between du (1.48) and 4-dl (2.72) so, we don’t reject the Ho which means there is ni autocorrelation problem. This study conceptualizes customer satisfaction as customers` contentment about two electronic banking services: ATM and e-banking. Product improvements, are related to electronic banking products of what kind of technology used, location and number of ATMs, usability etc. Reliability stands for range of products offered, information provided. Lastly efficiency is comprehended as login and faster usage of e-banking and ATM/banking card performance. The results indicate that all Cronbach’s Alpha values are within the acceptable level, whereas services and reliability are strongly correlated, but correlation between efficiency and satisfaction is weak. The regression equation formulates the linear relationship among the dependent and independent variables. The answers of the participants indicate that it was seen that while service and reliability have positive effect on customer satisfaction, efficiency`s effect is negative. The choices of the participants indicate that one-unit increase in Product improvements, that are related with electronic banking products of what kind of technology used, location and number of ATM`s usability (1 unit increase refers to 1 level shift of the opinion of the participants with respect to their satisfaction on the subject matter) will increase customer satisfaction by 0,522 units which is conceptualized as contentment of customers about two electronic banking services: ATM and e-banking. Moreover, one-unit increase in Reliability which stands for stands for range of products offered, information provided will increase customer satisfaction by 0,383 units, whereas one-unit increase in efficiency, which is comprehended as login and faster usage of e-banking and ATM/banking card performance will decrease customer satisfaction by 0,310 units. The results indicate an expected conclusion about customer satisfaction and efficiency. The reason for that might be the fact that people do not believe in speed in banking services and rather find it risky. Future researchers might focus on understanding the negative results related with faster usage of e-banking and ATM/banking card performance and customer satisfaction. Daniel E (1999) Provision of electronic banking in the UK and the republic of Ireland. The International Journal of Bank Marketing, pp: 72-82. DeYoung R (2001a) The financial performance of pure play internet banks. Economic Perspectives 25: 60-75. DeYoung R (2001b) The financial progress of pure-play internet banks. BIS Papers No 7. DeYoung R (2001c) Learning-by-doing, scale efficiencies, and financial performance at internet-only banks. Federal Reserve Bank of Chicago, Chicago. Pikkarainen T, Pikkarainen K, Karjaluoto H, Pahnila S (2004) Consumer acceptance of online banking: an extension of the technology acceptance model. Internet Research, pp: 224-235. Flavian C, Torres E, Guinaliu M (2004) Corporate image measurement. A further problem for the tangibilization of internet banking services. The international journal of bank marketing, pp: 366-384. Robinson T (2000) Internet banking: still not a perfect marriage. Oliver RL (1999) Whence consumer loyalty? Journal of Marketing, pp: 33-44. WTO (1985) Identification and evaluation of those components of tourism services which have a bearing on tourist satisfaction and which can be regulated and state measures to ensure adequate quality of tourism services. World Tourism Organization, Madrid. Jamal A (2004) Retail banking and customer behavior: a study of self-concept, satisfaction and technology usage. The International Review of Retail, Distribution and Consumer Research, pp: 357-379. Oliver RL (1980) A cognitive model of the antecedents and consequences of satisfaction decisions. Journal of Marketing Research, pp: 460-469. Oliver RL (1980) Theoretical bases of consumer satisfaction research: Review. Theoretical, pp: 206-210. Lovelock C, Wirtz J (2007) Services marketing: people, technology, strategy. Pearson Prentice Hall, New Jersey. Oliver RL (1993) Cognitive, affective, and attribute bases of the satisfaction response. Journal of Consumer Research, pp: 418-430. Besterfield DH (1994) Quality control. Prentice Hall, Engelwood. Wang Y, Lo H-P, Chi R, Yang Y (2004) An integrated framework for customer value and customer-relationship-management. Managing Service Quality, pp: 169-182. Fornell C (1992) A national customer satisfaction barometer: the Swedish experience. Journal of Marketing, pp: 6-21. Kotler P (1991) Marketing management: analysis planning, implementation, and control. Prentice Hall, New Jersey. Westbrook RA (1987) Product/consumption-based affective responses and postpurchase processes. Journal of Marketing Research, pp: 258-270. Anderson EW, Sullivan MW (1993) The antecedents and consequences of customer satisfaction for firms. Marketing Science, pp: 125-143. Tse DK, Wilton PC (1988) Models of consumer satisfaction formation: An extension. Journal of Marketing Research, pp: 204-212. Patterson PG, Johnson LW, Spreng RA (1997) Modeling the determinants of customer satisfaction for business-to-business professional services. Journal of the Academy of Marketing Science, pp: 4-17. Sharma N, Ojha S (2004) Measuring service performance in mobile communications. The Service Industries Journal, pp: 109-128. Dube-Rioux L (1990) The power of affective reports in predicting satisfaction judgments. Advances in Consumer Research, pp: 571-576. Homburg C, Koschate N, Hoyer WD (2006) The role of cognition and affect in the formation of customer satisfaction: a dynamic perspective. Journal of Marketing, pp: 21-31. Zeithaml VA (2002) Service excellence in electronic channels. Managing Service Quality, pp: 135-139. Liu C, Arnett KP (2000) Exploring the factors associated with web site success in the context of electronic commerce. Information and Management, pp: 23-33. Liu C, Arnett KP, Litecky C (2000) Design quality of websites for electronic commerce: fortune 1000 webmasters’ evaluations. Electronic Markets, pp: 120-129. Wolfinbargera M, Gilly MC (2003) eTailQ: dimensionalizing, measuring and predicting eTail quality. Journal of Retailing, pp: 183-198. Long M, McMellon C (2004) Exploring the determinants of retail service quality on the internet. Journal of Services Marketing, pp: 78-90. Mayer RC, Davis JH, Schoorman FD (1995) An integrative model of organizational trust. The Academy of Management Review, pp: 709-734. Parasuraman A, Zeithaml VA, Berry LL (1985) A conceptual model of service quality and its implications for future research. The Journal of Marketing, pp: 41-50. Zeithaml VA, Parasurman A, Malhotra A (2000) S-service quality: definition,dimensions and conceptual model. Marketing Science Institute, Cambridge. Yang Z, Feng X (2004) Online service quality dimensions and their relationship with satisfaction; a content analysis of customer reviews of securities brokerage services. International Journal of Service Industry Management, pp: 302-326. Madu CN, Madu AA (2002) Dimensions of e-quality. International Journal of Quality and Reliability Management, pp: 246-258. Wolfinbarger M, Gilly MC (2002) ComQ: dimensionalizing, measuring and predicting quality of the e-tail experience. Center for research on information technology and organizations, California. Koskosas LV (2008) Trust and risk communication in setting internet banking security goals. Risk Management, pp: 56-75. Liao Z, Wong WK (2008) The determinants of customer interactions with internet-enabled e-banking services. The Journal of the Operational Research Society, pp: 1201-1210. Metin H, Coskun A (2016) The effect of leadership and organizational culture on effectiveness of NGOs: an empirical study. Nile Journal of Business and Economics, pp: 3-16. Jun M, Cai S (2001) The key determinants of internet banking service quality: a content analysis. International Journal of Bank Marketing, pp: 276-291. Metin H (2017) Contingency perspective in non-governmental organizations (NGOs). LAP LAMBERT Academic Publishing. Chen X, Skully M, Brown K (2005) Banking efficiency in China: Application of DEA to pre- and post-deregulation eras: 1993-2000. China Economic Review, pp: 229-245. Mester LJ (1987) A multiproduct cost study of savings and loans. The Journal of Finance, pp: 423-445. Clark JA (1996) Economic cost, scale efficiency, and competitive viability in banking. Journal of Money, Credit and Banking, pp: 342-364. Evanoff DD, Israilevich PR (1995) Scale elasticity versus scale efficiency in banking. Southern Economic Journal, pp: 1036-1046. Berger AN, Humphrey DB (1991) The dominance of inefficiencies over scale and product mix economies in banking. Journal of Monetary Economics, pp: 117-148. Altunbasa Y, Liub M-H, Molyneuxc P, Seth R (2000) Efficiency and risk in Japanese banking. Journal of Banking and Finance, pp: 1605-1628. Mester LJ (1996) A study of bank efficiency taking into account risk-preferences. Journal of Banking and Finance, pp: 1025-1045. Kwan SH (2006) The X-efficiency of commercial banks in Hong Kong. Journal of Banking and Finance, pp: 1127-1147. Cebenoyan S, Cooperman ES, Register CA, Hudgins SC (1993) The relative efficiency of stock versus mutual S and Ls: A stochastic cost frontier approach. Journal of Financial Services Research, pp: 151-170. Berger AN (2003) The economic effects of technological progress: evidence from the banking industry. Journal of Money, Credit and Banking, pp: 141-176. Nunnally JC, Bernstein IH (1994) Psychometric theory. McGraw-Hill.